How does this adaptation of The Bard’s most tragic love story measure up to the rest? SPOT.ph blogger Paul Daza finds out. STORY: The Bard's immortal tale of a pair of "star-cross'd lovers" from two feuding families in 14th century Italy gets remade yet again, this time with True Grit Oscar nominee Hailee Steinfeld as Juliet and British model/actor Douglas Booth as Romeo. The script is adapted from Shakespeare's classic play by Downton Abbey creator Julian Fellowes. The "authentic" locations. This new Romeo & Juliet is apparently the first big-screen version to be filmed in the northern Italian cities of Verona and Mantua, where Shakespeare set his tragic romance. (Franco Zeffirelli's 1968 classic, starring Olivia Hussey as Juliet, was filmed in Italy, but not in Verona and Mantua. Baz Luhrmann's 1996 update was set in contemporary America and filmed in the USA and Mexico.) The best reason to see this latest version, hands down, is the enchanting Italian scenery, with its evocative towers, uplifting frescoes, and seductive gardens. Douglas Booth as Romeo. The movie may be called Romeo & Juliet but Romeo certainly comes off better than Juliet does in terms of acting skill and charisma. As played by heretofore unknown British actor/model Douglas Booth (who's most famous for playing Boy George in a BBC-produced made-for-TV movie in 2010), this Romeo certainly has the looks and talent to be another tween idol a la Robert Pattinson and Taylor Lautner. If Booth doesn't become a star like those himbos from The Twilight Saga, it certainly won't be from a lack of effort on the part of the filmmakers. Romeo & Juliet gives him lots of "exposure" as a matinee idol to be, from showing him bare-chested (in his very first scene!) to giving him quite a few opportunities to display his emotional range. Booth handles the difficult Shakespearian dialogue with aplomb, so much so that co-star Hailee Steinfeld's Juliet looks amateurish by comparison, especially in the film's first half. The supporting cast of adults. Paul Giamatti is terrific as the well-meaning Friar Laurence, while Damian Lewis is chilling as Juliet's father, Lord Capulet. As Juliet's nurse, Lesley Manville adds a welcome dose of levity to the unfolding tragedy. The bastardization of Shakespeare's words. The new Romeo & Juliet movie has been attacked for the liberties which scriptwriter Julian Fellowes took in revising The Bard's words. In an interview with The Canadian Press, Fellowes acknowledged the controversy, saying, "All the stuff you remember is all in, I don’t think we’ve cut any line that is ever one of the quoted ones... About 70 per cent of it is Shakespeare anyway, because quite often we’ve shortened the scene but that doesn’t mean we’ve altered the lines." Based on an astute comparison by Peter Canavese in Palo Alto online, however, Fellows has made more changes than he admits to. Here's the original version of Romeo's "heartsick appraisal of love" to Benvolio: "Love is a smoke raised with the fume of sighs;/Being purged, a fire sparkling in lovers’ eyes;/Being vexed, a sea nourished with loving tears./What is it else? A madness most discreet,/A choking gall, and a preserving sweet." Here is Julian Fellowes’ rewrite of the same monologue: "Love is a smoke, raised with the fume of sighs./A madness drenched in syrup, choked with rage." That's 41 words used by Shakespeare compared to Fellowes' truncated, 18-word version. And since the new film is 118 minutes long versus the play's "four hours" as estimated by Fellowes, it would seem that only 50% or even less of Shakespeare's words are in the film, and not the 70% Fellowes estimates. Hailee Steinfeld as Juliet. So convincing as the young girl who hires a U.S. Marshall to find her father's murderer in True Grit (2010), who would have thought that the Oscar-nominated Hailee Steinfeld would be so wanting as a 14-year-old who falls passionately in love for the first time? To be fair to Steinfeld, she is quite good in the second half of Romeo & Juliet, from the point when she wakes up after making love to Romeo for the first time until the film's tragic end. Her work in the first half, however, is simply unsatisfactory, her attempts to convince us that she has fallen in love at first sight with Romeo lacking in passion and sizzle. Watching Steinfeld and Booth share their escalating feelings for one another at the Capulet's masquerade ball, and later during the famous balcony scene ("O Romeo, Romeo, wherefore art thou Romeo? "), one can only guess that Steinfeld's lukewarm line delivery is the result of her never having been in love. 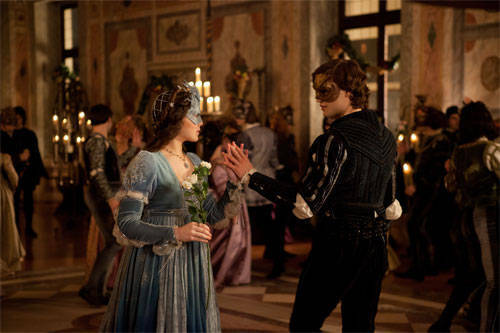 IN BRIEF: Though it features handsome production values, a more accessible story and an appealing Romeo in newcomer Douglas Booth, this Romeo & Juliet pales in comparison to previous versions due to a half-baked performance from Hailee Steinfeld and a script that takes too many liberties with Shakespeare's original text.